Pass-It-On is a non-profit project that seeks to provide a meaningful way to distribute unwanted, albeit useful items to benefit the needy. Click here to sign up as a Donor so that your particulars can be autofilled when donating new items. If your organisation is not listed in the List of Voluntary Welfare Organisation, we welcome you to join us! How does Pass-It-On help VWOs and those in need? 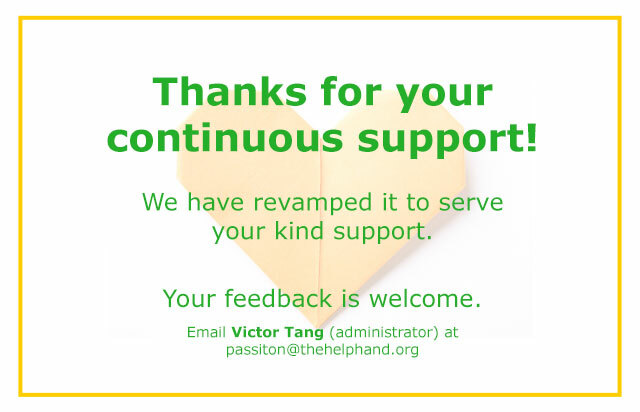 Pass-It-On reduces the times it takes to search for a donated item and it helps the VWO save on costs by cutting down on purchases for these items. The process is efficient, effective, fuss-free and fulfilling for both donors and beneficiaries / recipients. A social worker has been following up with a low-income family. Mdm Nasir’s husband was recently admitted to the hospital and their only daughter is intellectually disabled. The one-bedroom flat they live in is rented and sparsely-decorated. Knowing that her daughter requires constant attention, the social worker requested for a washing machine through the Pass-It-On website to free Mdm Nasir from household chores to allow her to focus on caring for her daughter. A donor saw the need and liaised with the social worker who engaged The Helping Hand to deliver the item at a subsidized rate. If you wish to join us, please download the registration form and a letter of undertaking form that must be completed by each user seeking to be registered with us. If your organisation is already listed on our website and you are a new user, kindly fill up the ‘Letter of Undertaking’ form only. We will promptly process your application as soon as the completed documents are received. An auto-generated email containing the login details will be sent to each user thereafter. Please check the spam folder in case the email lands there. Thank you.